Founded: 14th c. Current style: baroque. It is a short distance from the old town, on a promontory that is reached via the singular Rúa das Trompas, crossing Belvís Park, a kind of natural trench separating it from the historical quarter. Beside it is another of the city’s important religious institutions, the seminary called “Seminario Menor” (which also houses a pilgrim hostel). In the past, most of Belvís’ nuns were daughters of the bourgeoisie, which explains the slowness of the building work and the sobriety of the convent (the daughters of nobles brought along greater gifts). The convent building was rebuilt in the early 18th century. The simple façade features the coat of arms of Archbishop Monroy, patron of the construction, and a tower linking the convent church and the “Virgen del Portal” chapel (1702), which form a right angle. The church, which is only visible during Sunday worship, is set aside for the nuns’ intimate prayers. It was built during the first half of the 18th century by Casas y Novoa, who also designed the Cathedral façade. The building is very simple and sober. The most outstanding feature is the façade of the communion window (through which the Dominicans receive communion), in which the architect employed his characteristic geometrical-plant decoration. This is a simple chapel in which the “Virgen del Portal” statue (13th-century Gothic) stands out. The Virgin is accompanied by two small statues, which probably represent the Christian people. Above the Virgin’s alcove is an image of the order’s founder, St. Dominic. On the left, St. Joseph, and on the right, the Dominican St. Martin de Porres (better known as “Brother Broom”). Devotion to the “Virgin del Portal” is deeply rooted in Santiago. Her name comes from an image that appeared during the convent’s original construction in the 14th century and which was initially placed in the gatehouse. In the 17th century the nuns took it into the church on several occasions, but the image always returned mysteriously to the gatehouse. They therefore decided to make a small sanctuary there. The Virgin began working miracles and her fame spread abroad. She was invoked for all kinds of illnesses and also for passing exams. Her feast day is celebrated on September 8th with a very popular pilgrimage, which some self-sacrificing devotees undertake on their knees or with bare feet. Other rites to implore this Virgin’s favour involve the offering of candles, requesting the Virgin’s cloak to place on the sick and holy water from the sanctuary. 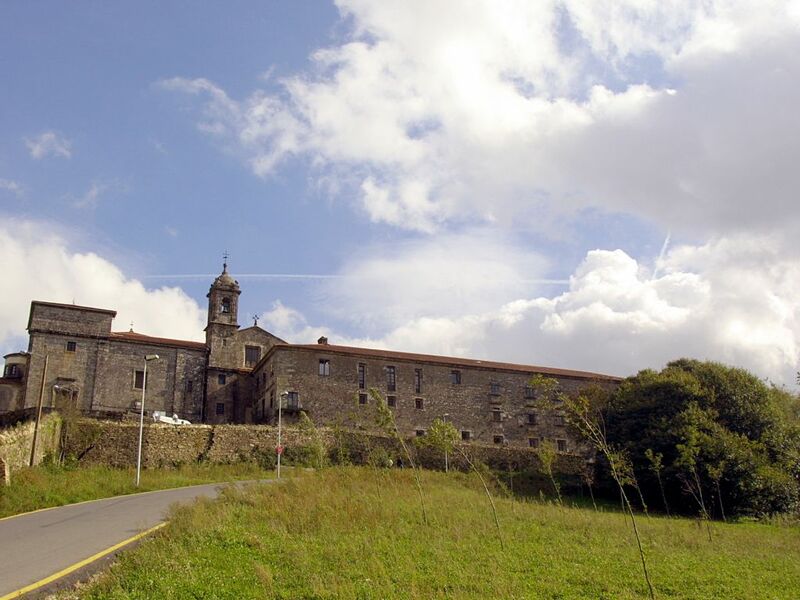 There are currently 30 nuns in the Convent of Belvís. Their daily routine includes, apart from domestic chores, looking after the garden and musical rehearsals (for mass and the office of vespers), embroidering for churches and for individuals, as well as making wafers for the city’s churches. They are famous for their delicious desserts, which can be ordered (almond biscuits, “mantecados,” Santiago’s typical almond cake) or are available (biscuits, wafer) for buying whenever the revolving window is functioning.